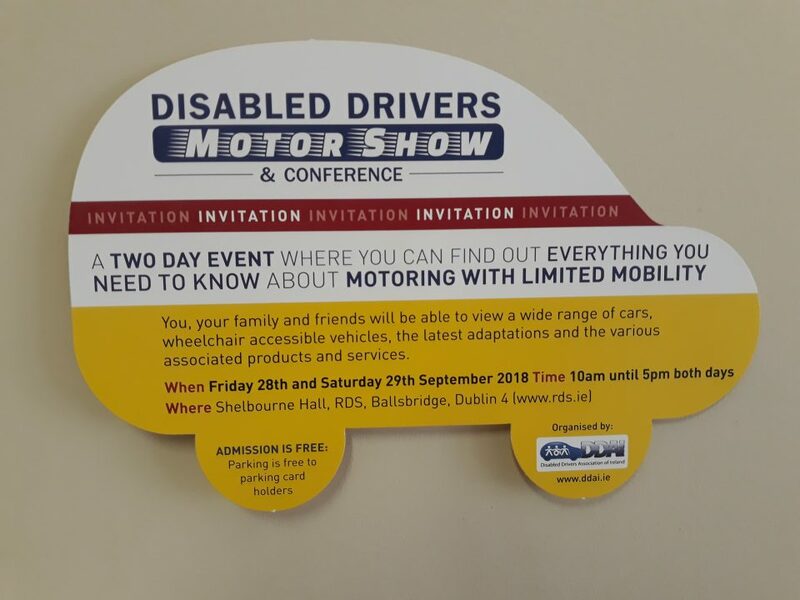 The Disabled Drivers Asociation of Ireland are pleased to announce that the Disabled Drivers Motorshow and Conference will take place once again in the Shelbourne Hall, RDS, Dublin on Friday 28th and Saturday29th September 2018. The Show has been organised to need the need for an event that demonstrates the latest vehicles and associated products and services to people with limited mobility, their families, carers and healthcare professionals. Mobility products including wheelchairs and mobility scooters will also be on show. The conference will cover topics including: Vehicle Finance, Vehicle Adaptations, Electric Vehicles(EV), Operation Enable and Drive from Wheelchair Vehicles. Exhibitors to date include- Renault Ireland, Fort motors(FORD), Opel Ireland, Toyota, Frank Kean VW, The Revenue Commissioners, Disabled Drivers Association, Mobility Ireland, Freedom Mobility, TBC Conversions, Izzy Wheels, Go Mobility, Shopmobility, Donal Murtagh Mobility, OC Mobility, Wheelchair Cars Ireland, Irish Wheelchair Association, Wheelchair Solutions.